Unlike my last recipe post, this is not resolution-friendly. At all. In all fairness, I did make this for Christmas dinner, before New Year’s Resolutions would have been made. If you’re like me & feel you can justify the extra calories because you’re growing a small human in your belly, go for it! It’s so worth it. If you did make a resolution to eat better, then maybe just pin it on Pinterest until a) you make it to your goal weight, or b) you do what I inevitably do & reneg on your resolution in mid-February. This is a Pioneer Woman recipe, so when it says “serves 8,” it really means “serves 8 hungry cattle ranchers, or 27 cityfolk.” The recipe below is a half recipe, which our family of 3 ate for days afterwards. I also subbed half & half for her 3-to-1 cream-to-milk ratio for two reasons. First, it lightened it up just slightly. But mostly, that’s what I had on hand, because I had made this for Christmas breakfast. Preheat your oven to 400 degrees. Grease a small baking dish with cooking spray. 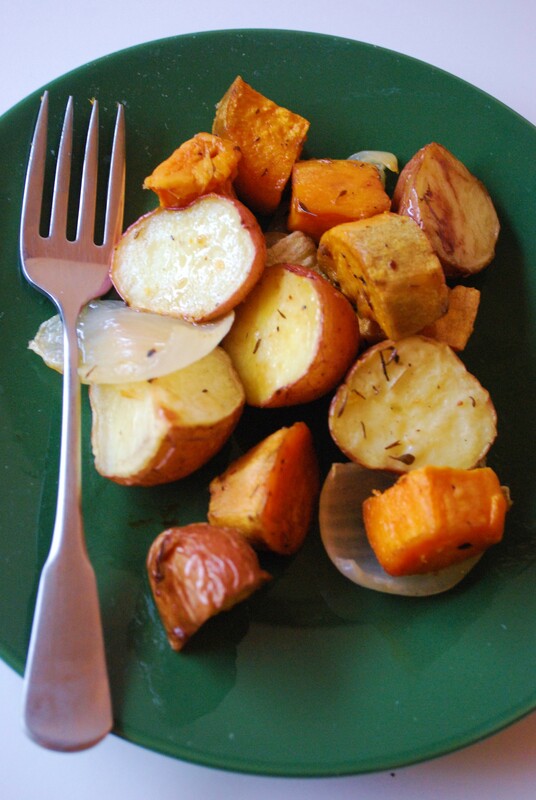 Cut potatoes into third- to half-inch slices, then cut each slice into fourths. In a smallish bowl, whisk together half & half, flour, garlic, salt, & pepper. Place half the potatoes in the bottom of the dish, then cover with half of the half & half mixture. Then place the rest of the potatoes over the top & pour the rest of the half & half over the top. Cover with foil & bake for 30 minutes. Uncover & bake another 20 or until the potatoes are golden brown & fork-tender. Then sprinkle generously with cheese & bake another 5 minutes or until the cheese is nice & bubbly. 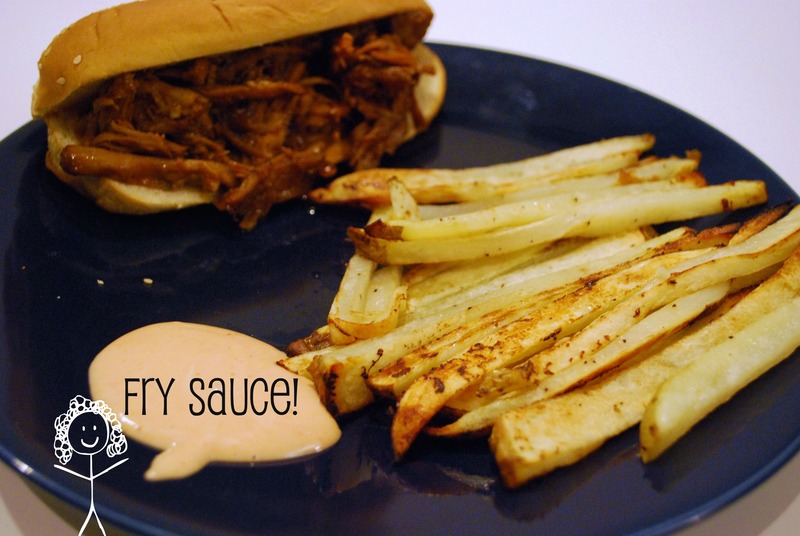 Perfect oven fries with genuine fry sauce. I LOVE FRENCH FRIES. I crave them all the time. 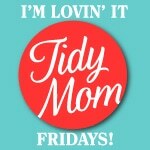 (Even when I’m not pregnant!) However, rather than frequent our local Five Guys often enough for them to know my name & “usual,” I thought I’d make my own. Probably healthier anyway, right? So a couple weeks ago I searched my Google Reader — it may or may not have been the first time in like 2 months that it had been open, so I won’t tell you how many unread posts were in there — & found this treasure over at Talkin’ Chow, Playin’ House. They are PERFECT. I won’t tell you how many times I’ve made them since. I had attempted sweet potato fries once, early in our marriage, & I ran into several problems: 1) they were impossible to cut, 2) they didn’t cook uniformly, & 3) the ones that weren’t charred were soggy & greasy. Briana’s method takes care of all of these problems beautifully, & even gives the fries that crispy, fried texture without all the oil! Her fries use cayenne to give them a little bit of a kick, but it was a bit too much of a kick for The Munchkin, so here’s my 2-year-old-friendly version. 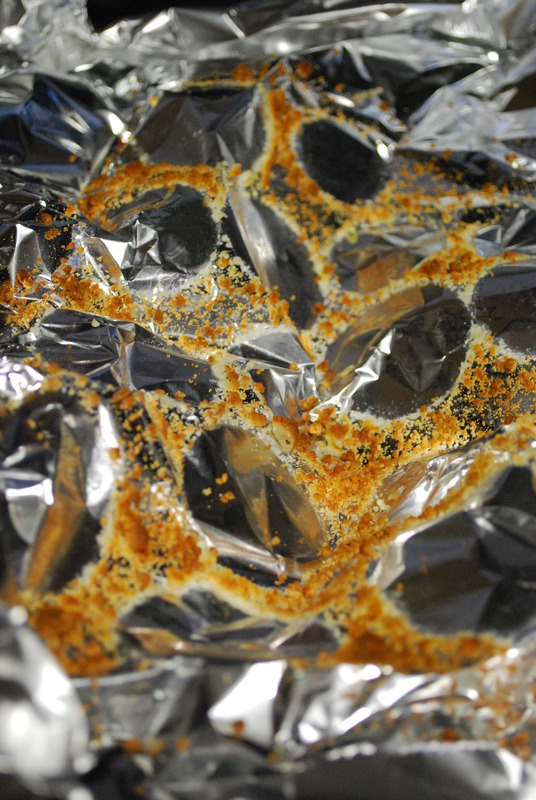 Preheat your oven to 425 & GENEROUSLY grease a baking sheet with cooking spray. Don’t use foil; it’ll actually make the fries stick worse! Scrub your potatoes & cut each one into a “brick” by slicing off a little of the rounded bit on each long side. Don’t worry about trimming the short ends; this leaves just the perfect little bit of tasty skin on. Then make 1/4- to 1/2-inch slices long-ways in each brick. Rotate the brick 90 degrees & make more slices. Ta-da! Fries! Throw your fries into a mixing bowl & add the oil. 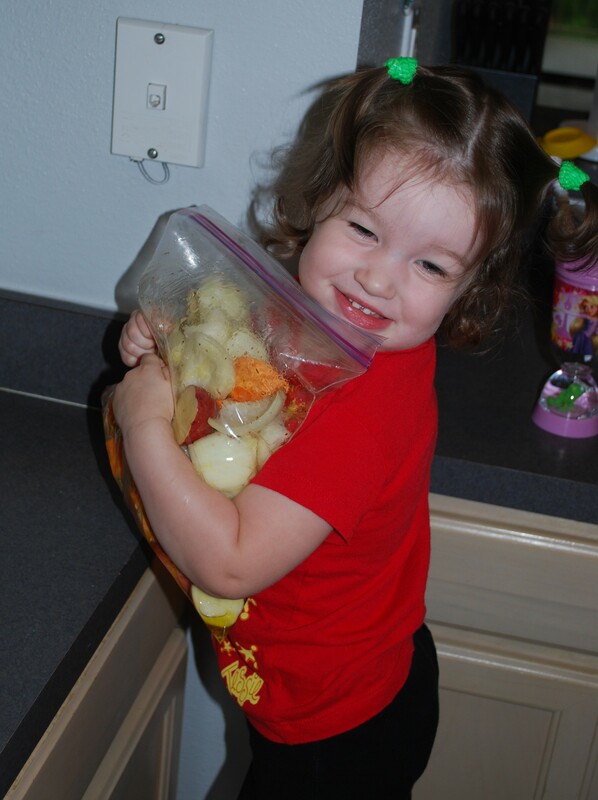 Let your kitchen helper toss them with her clean hands to coat. Combine the seasonings in a tiny bowl, then gradually sprinkle them over the fries as your kitchen helper continues to toss, making sure they’re coated evenly. Spread the fries out on your cookie sheet in a single layer so they don’t make each other soggy. Bake 15 minutes, pull them out, flip them all over with a spatula so they can crisp on the other side, then bake another 15 minutes. Now wait, we’re not done yet. No fry is complete without genuine Utah fry sauce. At its most basic, fry sauce is essentially mayo & ketchup, but there are many permutations of this condiment concoction, which is served at almost every local fast-food joint in the state. Briana’s uses barbecue sauce like a certain restaurant chain does out there, some places add a little garlic powder, & one restaurant that I won’t name even adds relish to theirs (as a pickle hater, I consider this a travesty). Before I answer your question, “Funeral potatoes?? 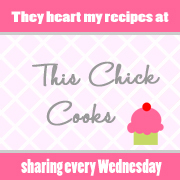 ?” please let me draw your attention to the fact that — I actually cooked something! Okay, so, funeral potatoes. 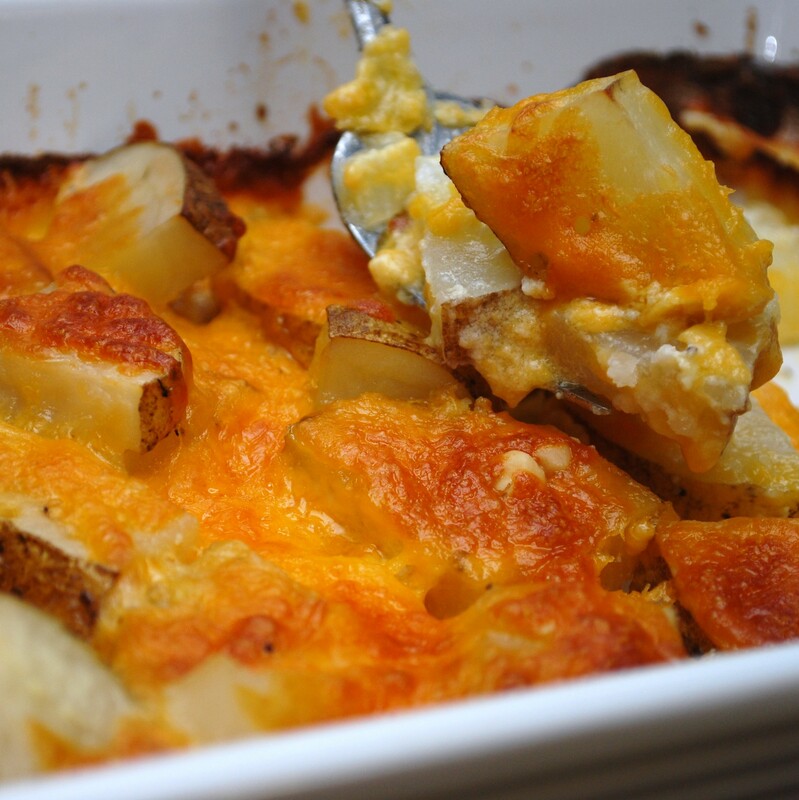 They’re basically au gratin-style potatoes so named because of their prevalence at (well, after) Mormon funerals. 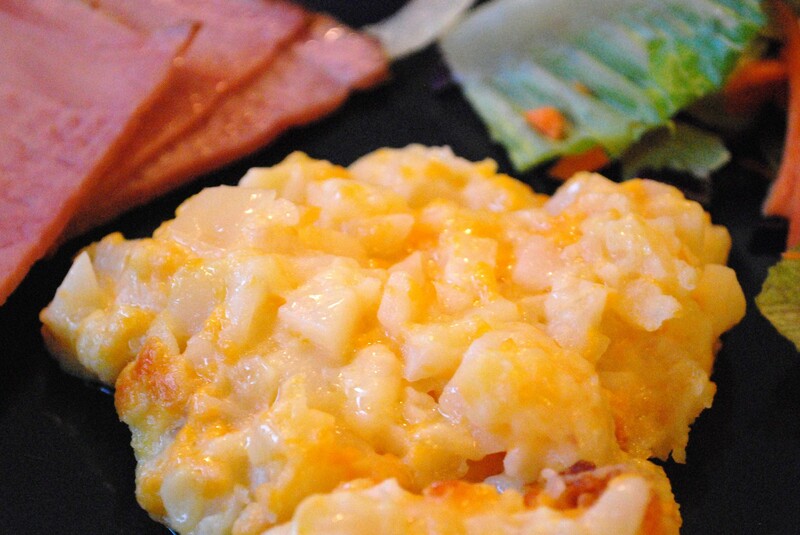 I don’t really know why honeybaked ham & au gratin potatoes are the unofficial official food of Mormon funerals — & at Easter, now that I think of it… irony? — but they’re tasty, so that’s all that matters, right? Oh, & they’re easy. At least this recipe is. 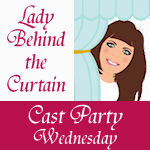 Which my I-haven’t-really-cooked-in-forever-&-I-may-need-to-run-to-the-bathroom-at-any-moment self is a big fan of. There are a million different variations of this Mormon staple (in fact, there were no fewer than 4 different delicious varieties at a potluck I attended Saturday… which may explain my irrational craving for them all week…), but here’s a basic easy version my friend Chelsey shared with me from Cooks.com. Let your kitchen helper help you mix all ingredients together in a large bowl. Optional: sprinkle on corn flakes & drizzle with melted butter. Spread into the bottom of a 9×13 baking dish. Anyone else remember those commercials? 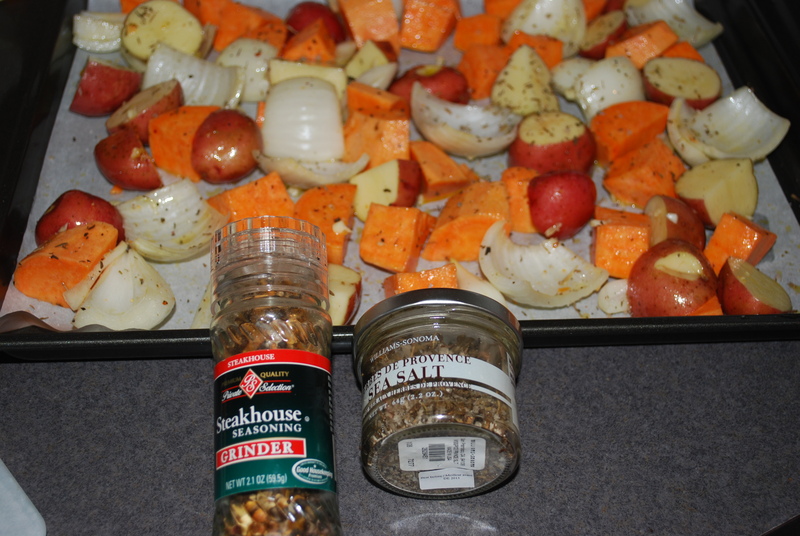 Well, these potatoes don’t use the Shake & Bake mix you buy at the store; you use your very own herbs & seasonings. This keeps the sodium level down — a plus! We seriously love these potatoes. The recipe first came from one of my Young Women’s leaders in — you guessed it — the ward cookbook! That thing is worth its weight in gold, I tell you what. Since then I’ve started customizing the spices to complement whatever meal I happen to be making. They’re delicious every time! Seasonings: The original recipe calls for approx. 2 Tbsp. dried rosemary & salt & pepper to taste. This way is delicious! So is using dill in its place. Tonight, though, I went with Herbes de Provence Sea Salt & my Steakhouse Grinder. Preheat your oven to 375. Line a baking sheet with parchment paper. 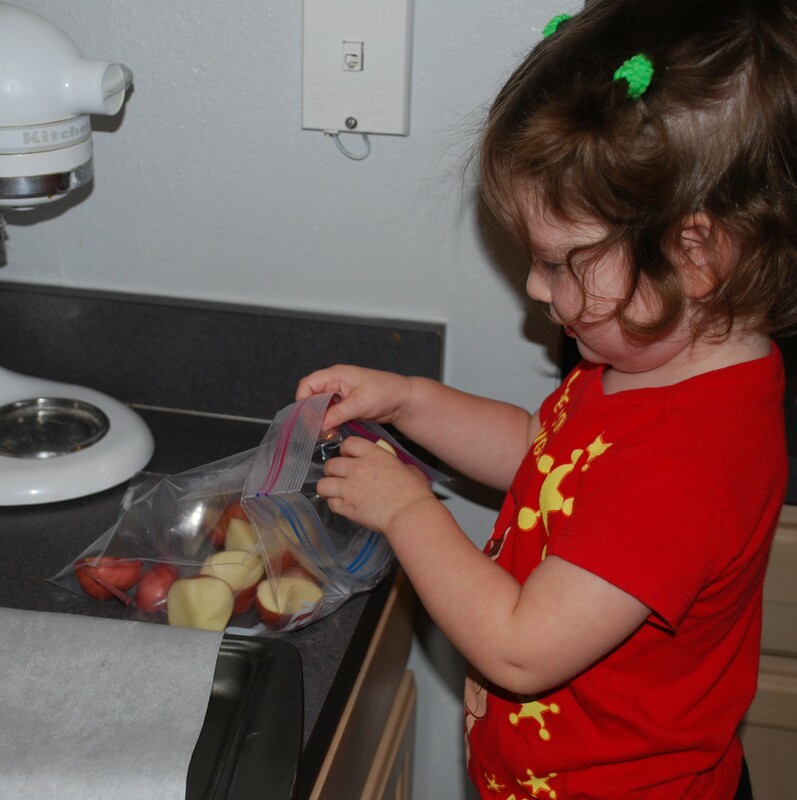 Let your kitchen helper help you put the potato & onion chunks in a gallon Ziploc bag. Let your kitchen helper shake it up! This is where I sprinkle on the seasonings evenly. Arrange in a single layer on your prepared baking sheet. Bake for 30 minutes or until fork-tender. 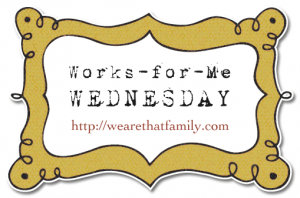 Let me know what seasonings you decide to use! Back to St. Patty’s Day: Magic Zucchini Coins. So now what do I post, after a day like that? The best answer I could come up with was: what I was going to post today anyway. These Magic Zucchini Coins (the more often I type “zucchini,” the more wrong it looks to me…), which I got from the Sesame Street cookbook, are perfect for St. Patrick’s Day! They’re green, they turn golden in the oven, & they’re coins! Now all we need is a rainbow to put them under. (Dang, shoulda thought of that when I was setting up the shot…) They’re also quick, easy, & perfect for little kitchen helpers! 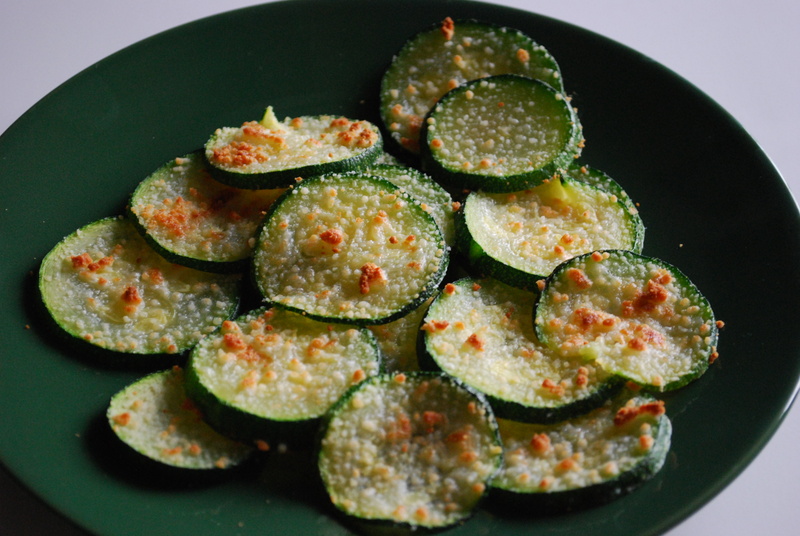 Slice some small zucchini or yellow summer squash (or a combo) into 1/4-inch-thick slices. A half a zucchini was enough for The Munchkin & me because she’s not wild about the stuff. If the zucchini (looks wronger & wronger…) is ripe enough & your kitchen helper is old enough, the Sesame Street cookbook recommends letting them slice it with a plastic knife. Boil or steam until just tender, 3-5 minutes. (We boiled to save dishes, but steaming will preserve more nutrients.) Drain & set aside to cool slightly. Meanwhile, preheat your broiler (on “high,” if yours has more than one setting). Broil a couple minutes until the parmesan turns golden-brown. Then let your little leprechaun devour this healthy veggie side with his shamrock pizza or rainbow wraps!